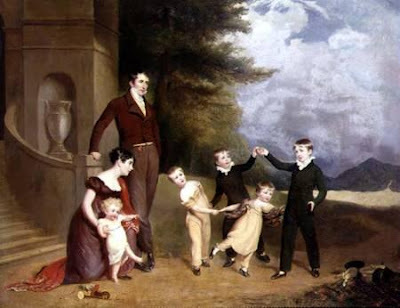 When Georgiana gave birth to her second child in 1785 everything was set up grandly for the birth of the Devonshire heir. What came out was another girl, to be named after her aunt, Harriet; although she would henceforth almost always be referred to as 'Harryo.' Not only was a girl born but a typical middle child. Harryo lacked the physical charms of her famous mother. She may have been fashionably pale but she lacked her mother's figure and her chubbiness was constantly commented on. She also decided to lack her mother's love of fashion, but this was more an act of defiance. In fact, Harryo seemed to be more cynical and perhaps a little bitter than her siblings Little G and Hart were. What physical charms Harryo lacked she made up with her cleverness and intelligence. Many would comment through the years on her interesting conversation and obvious smarts. Put all these aspects together and we have some very interesting perspectives on living with the Devonshires. We also have a big Bess-hater.